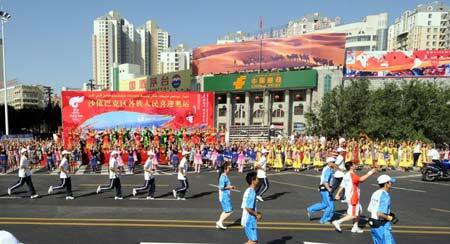 The Olympic flame passes brightly through somewhere in the the Uyghur Autonomous Province ! Submitted by Martin Slavin on Tue, 17/06/2008 - 08:06. Submitted by Martin Slavin on Sat, 15/12/2007 - 14:18. 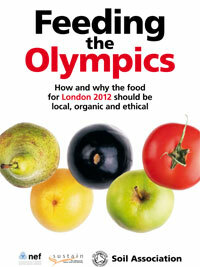 So who profits from Olympic developments? Labour MP Clive Betts has highlighted the need for transparency in public private sector deals for delivery of the Olympic developments and has called for parliamentary scrutiny of such arrangements. Deals were being discussed with Stratford City Developments ahead of consent for the Olympic bill to ensure conversion of flats into housing for 4,500 athletes (R. Booth, The Guardian, July 29, 2005). In 2003, the consortium Stratford City Developments and the LDA agreed not to frustrate the other's planning applications. The Guardian article notes: "A director of the consortium, Sir Stuart Lipton, was also a senior government advisor on the Olympics plans at the time of the co operation agreement. He was later forced to resign from his post as chairman of the Commission for Architecture and the Built Environment following accusations of conflict of interest between his role as government adviser and a leading private developer". Submitted by Carolyn Smith on Sat, 11/11/2006 - 16:17. LDA keeps its word! Open space at Eastway to close. The LDA acknowledged there would be a loss of open space during the construction of the Olympic Park. I received the following information after several enquiries. Submitted by Julian Cheyne on Thu, 09/11/2006 - 01:57. Remarkably, refutation of the inevitable benefits of hosting the Games is considered within the Olympic planning documents (Retail, Leisure and Sport Impact Assessment Appendices, Appendix 4 to the Environmental Statement, January 2004) as part of an attempt to calculate the amount and type of retail floor space that the Games could support. The Atlanta Games of 1996 was a retail disaster. Submitted by Carolyn Smith on Sat, 04/11/2006 - 14:15. The £550 million funding for the London Olympics will initially come from London council tax payers, £1.5 billion from the National Lottery, followed by a further £75 million from council tax, and £250 million from the London Development Authority (LDA). The International Olympic Committee (IOC) insists that host cities underwrite all liabilities. £15 million was spent on the London bid alone (Blowe, 2004; 2005). Submitted by Carolyn Smith on Fri, 03/11/2006 - 19:52. Submitted by Martin Slavin on Mon, 16/10/2006 - 13:04.